She's a Shoanti Cleric of Gozreh (Weather and Air (Cloud) domains). She has a round face, a ruddy complexion, and grey eyes. She has a piercing gaze that reflects her cunning and charisma. Her eyes do not sparkle; they flash, like the lightning she commands. Like most Shoanti, she is tattooed; on one side of her face is the holy symbol of Gozreh, a leaf with a drop of water. On the other size of her face is a storm cloud and lightning bolt. Unlike most Shoanti, however, she wears her hair long. 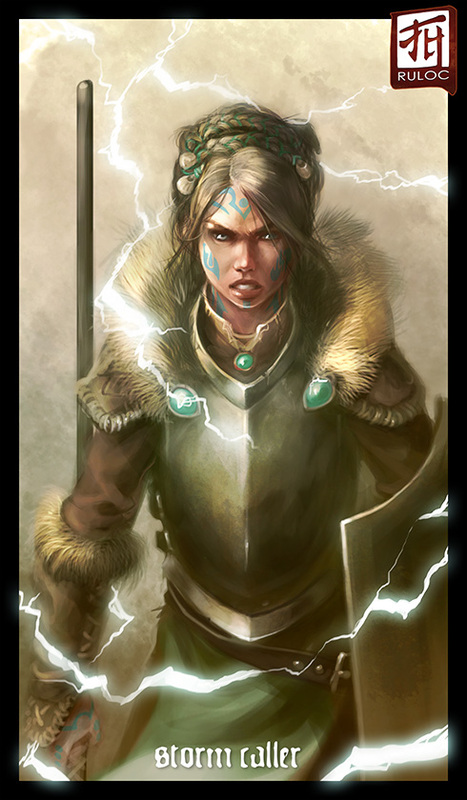 Gozreh marked her at birth, and Storm Caller- Kailani at birth- has been training to serve the god since early childhood. Her hair has never been cut. It has been elaborately locked, braided and pined up, and it's decorated with seaweed and small shells. As warrior training came second to her priestly calling, her build is fairly lean, without visible muscle. Her real talent is the way she can manipulate the wind and call down bolts of lightning. Her clothing is simple and practical; warm furs to keep out the cold, and sturdy, high boots that allow her to walk in deep snow without getting her feet cold or wet. She wears a simple breastplate, and carries a shield and trident (though she keeps them put away most of the time). She also carries healing potions and a healer's kit; someone has to apply the bandages once the storm passes, after all.